Grand Polycoats is among the leading manufacturers of High Performance Protective Paints & Coatings, providing customized solutions based on Polyurethane, Epoxy, Zinc Rich, Acid Resistant, Heat Resistant & Special Polymers for various substrates like ferrous & non-ferrous metals, concrete, glass, plastics, wood & others. Elastomeric Polyurea & Coatings for floor are the latest offerings. 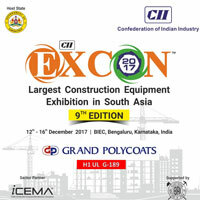 Today Grand Polycoats forges ahead, introducing several new products like Polyurea, Polyurethane Elastomeric Coatings, Concrete Preservation Treatment Solutions, Glass Coatings, Brass Coatings, Coatings for Castings, Weldable Coatings, Electrostatic Dissipative Tank Coatings and Coatings for Plastics.